I am always looking for different ways to tell the Nativity story in an interactive and engaging way. 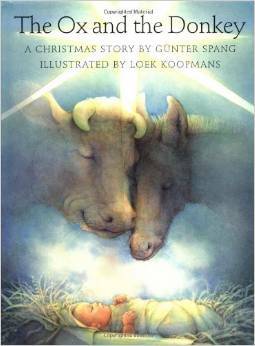 This year, I came across this version of reading “The Ox and the Donkey” by Gunter Spang. Gather the kids around a full-size nativity scene. Pass out to each child a Story Kit: a brown paper bag filled with a gray or black crayon and a strip of 4 glue dots. In the stable at the inn in Bethlehem lived an ox and a donkey. . . (until) It was a hard life for the donkey, and he was sad most of the time. From the animals basket, pass out Ox and Donkey masks. As we sing “O Little Town of Bethlehem,” color the ox or donkey mask. Then one winter night a beautiful star rose over the broken roof, its glow lighting up the entire stable. . . (until) The donkey was overjoyed. From the angel basket, pass out star stickers. As we sing “Do You See What I See?” stick the stickers at the top of the mask for the hair. On this holy night, Mary gave birth to the baby Jesus. . . (until) Perhaps he is cold, thought the donkey, and he leaned over the crib and blew gently on the baby with his warm breath, until the baby calmed down and went to sleep. From Mary and Joseph basket, pass out 2 heart stickers each for the nose. As we sing “Silent Night, Holy Night,” have the kids put the stickers on their mask. Early the next morning, shepherds hurried in from the fields. . . (until) The donkey and the ox took turns keeping the baby warm with their breath. From the shepherd basket, pass out the candy canes to be used to hold the mask up. As we sing “Go Tell It on the Mountain,” have the kids glue (using 2 glue dots) the candy cane to the base of the mask. Some wise men came to visit the Child. . . (until) And the donkey waved his tail furiously to keep insects away from the baby Jesus. From the Wise Men basket, pass out wiggly eyes for the eyes. The eyes represent the Wise Men seeing the star guiding them to Jesus. As we sing “We Three Kings,” have the kids glue on the wiggly eyes. Then one night Joseph and Mary packed up their belongings. . . (until) And the ox and the donkey celebrated too, sharing their hay and their warmth, best friends now – and forever after. Hi, Was looking for a different kind of Xmas play for the kids and came upon your site. THESE ARE GREAT!!!. I am going to use one of them. THANKS for your creativity and inspiration. I read the book using your ideas yesterday. We didn’t have a children’s program this year so this was my substitution and Children’s message. Since it was our Joy/rejoice week, the ending was perfect for this! I broke up the reading into 3 parts, and the kids went back to the pews in between sections.